Hello, hello, hello! 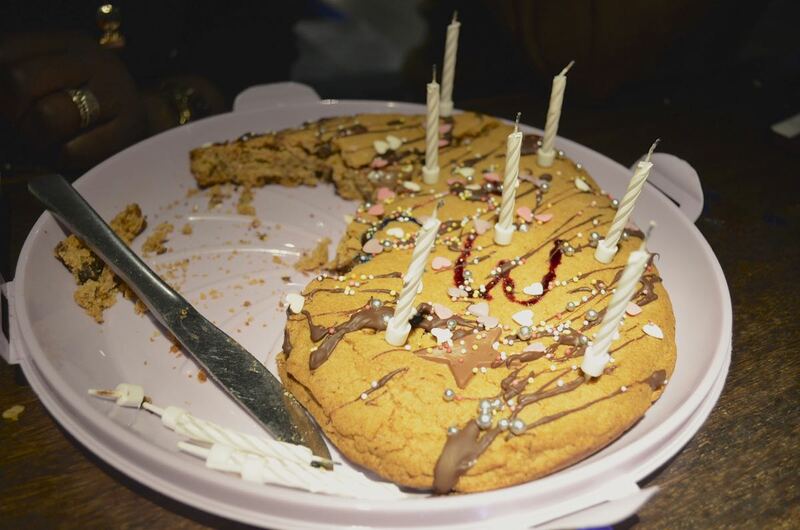 So Thursday was my dear mother’s birthday and to celebrate I decided to bake her this delicious GIANT Millie’s Cookie instead of the traditional, run-of-the-mill birthday cake as you can also see me make in this YouTube vlog. Now before you start judging me for depriving mummy dearest of birthday cake on the one day when it is socially acceptable to be seen eating some (note to self: it is NOT okay to include a Sainsbury’s Small Party Cake in weekly shop just because it looks pretty and you like cake), I’d like to point out that my mother, weird creature that she is, actually does not like cake. I know right, who doesn’t like cake? Well I’ll tell you who – my mum and I praise the lord daily that this apple not only fell far from that particular branch of the tree but also rolled down the hill and landed far, far away. 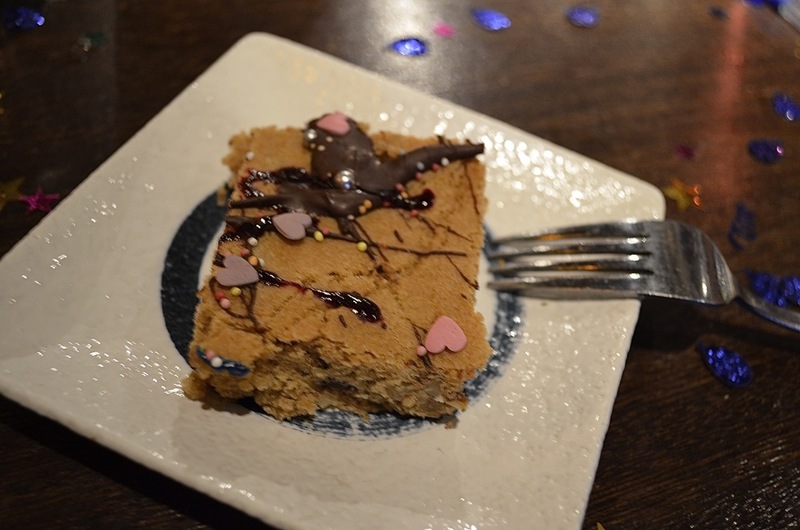 In cake. Which I ate. 100g dark chocolate chips (I used dark for a richer flavour, but if you prefer milk chocolate go ahead and use those instead). 2. Blast your butter in the microwave for 30secs or so until is is soft (but not completely liquified) and then cream (basically smush) it together with the sugar to make a smooth paste. 3. In a separate bowl lightly whisk the egg and then add this and the vanilla flavouring to the creamed butter/sugar mix. 4. 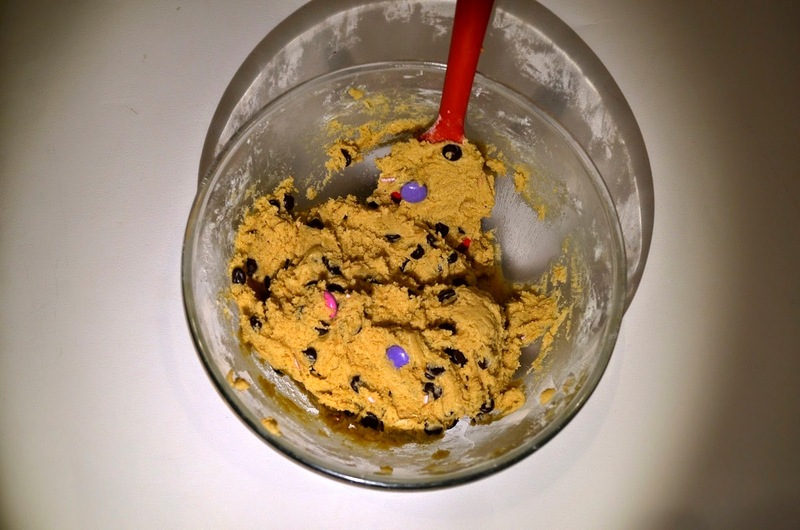 Sift in the flour, a quarter at a time, mixing the dough in between each, followed by the salt and the chocolate chips. Add the flour it is sections like this will make sure that the dough is evenly mixed and your cookies all come out equally delicious. 5. 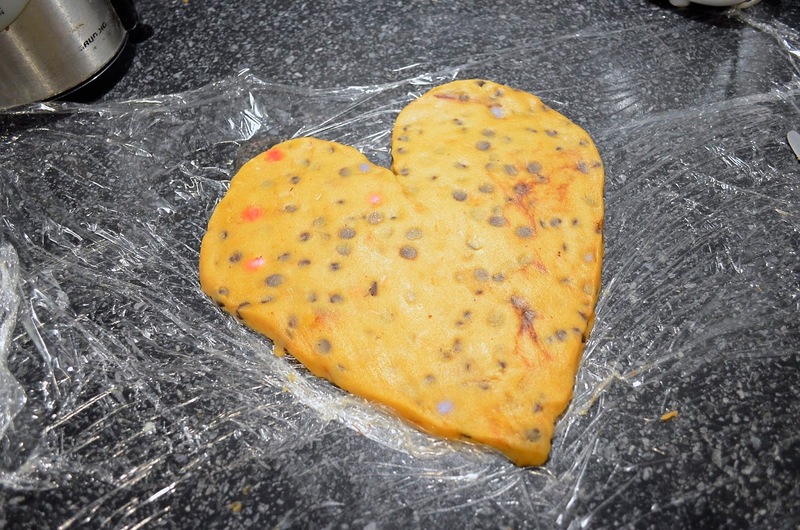 After throughly cleaning your work top (and covering it with cling film if you’re a germaphobe like me although this is admittedly unnecessary if you’ve cleaned it well), roll your dough into a large ball and then, using your hands, shape it into a heart. 6. Use a rolling pin to flatten your dough, rolling evenly lengthways and sideways across the dough so that you maintain the heart shape. If you begin to loose the heart shape just re-mould the edges with your hands (or you can cheat like me and, once it’s rolled out, use a knife to cute around the edges to make it heart-like again). 7. Next, grease a large baking tray with butter or oil to prevent the dough from sticking. Gently lift the dough, tucking your rolling pin under one end and rolling it underneath the dough to free it from the counter and gently lift it onto the tray. 8. Pop your giant cookie into the oven for 7-10 minutes until the edges begin to look brown and the top is slightly crisp to the touch. At this point the middle will still be nice and gooey – yum! 9. Leave your dough to cool for 30 minutes before you ice it as, if it is still warm, the icing will melt and slide all over the place – not a good look! Then, after 30 mins, go cray-cray with the icing pens and write your recipient a lovely message or perhaps even doodle a picture – et voila! 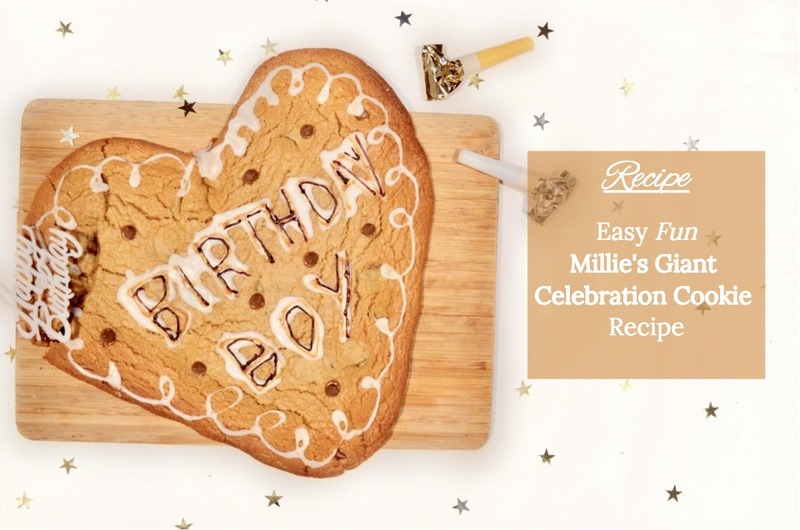 A Millie’s Cookie style celebration cookie lovingly handmade by you and for a fraction of the price. Whenever I am writing out tutorial posts be it a recipe, makeup look outfit inspiration, I always feel like I’m perhaps making things seem more complicated with the essay of instructions I inevitably provide. I could probably make these posts a lot shorter but I think I have a secret desire to be a teacher and thus feel the need to explain everything really, really thoroughly. In actual fact all of my tutorials are very much fool-proof (trust me for I am a fool, therefore I am the proof) and I promise that this cookie recipe is no different. I nailed it first time *huffs on nails and brushes them on shoulder* but if you’re still not convinced I’d be more than happy to make a short video for my YouTube channel showing you just how easy it is. As I said, you can see me making it in this vlog but I’d be happy to do a longer video. 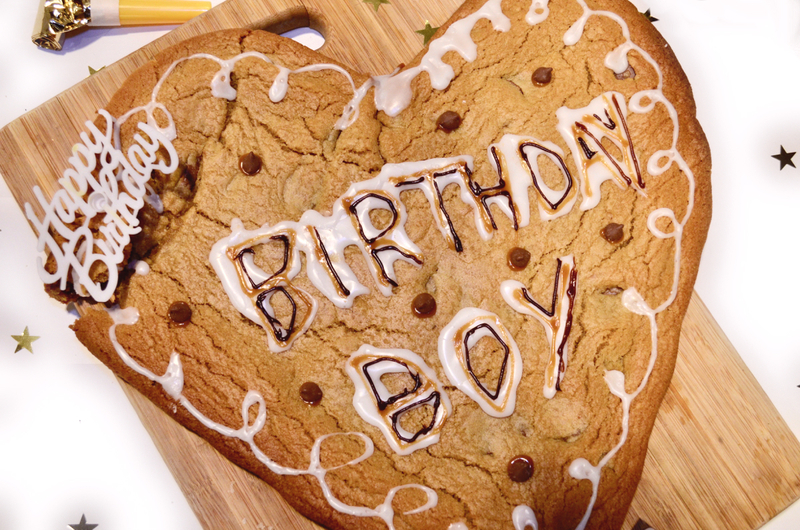 If you’d like me to, just leave a comment below letting me know and I’ll make sure to do one in time for Mother’s Day on the 22nd March although let’s be real – none of us are thinking about making this cookie to give away to someone else. I mean hello?! It’s a GIANT CHOCOLATE CHIP COOKIEEEEE!! !